With Governor Cuomo including a revised version of the 421-a property tax exemption in his new budget plan, renewing the lapsed tax break is again a major focus of the public policy agenda. Although benefits for new projects have not been granted since the program expired last January, 421-a remains the city’s largest tax expenditure at $1.4 billion this fiscal year, due to benefits that were approved and locked in prior to the program’s suspension. Despite the substantial cost of 421-a in foregone tax dollars, there has been little research examining its effects on housing prices and whether the tax benefit efficiently fosters housing development—the primary goal of the 421-a program. Condo buyers in Manhattan pay on average $35,500 more for an apartment with a 421-a benefit than buyers of similar units without the tax break. Condo buyers in the other boroughs pay on average $31,200 more for units with the 421-a benefit. Because of the higher purchase prices for condos receiving 421-a benefits, owners in Manhattan spend on average 53 cents to 61 cents for each $1 of tax savings. Condo owners in the rest of the city spend on average 42 cents to 50 cents for each $1 of tax savings. Owners of condos receiving 421-a benefits get more in tax savings than they are spending in higher purchase prices. As a result, the city “wasted” a total of roughly $2.5 billion to $2.8 billion in tax expenditures in 2005 through 2015 by providing tax relief to owners as opposed to encouraging additional housing development—the program’s intended purpose. As policymakers again consider renewal of 421-a, a reduced and better-targeted set of benefits could, at least in theory, lessen the program’s inefficiency while still providing some incentive for condo development. A program that does not oversupply tax subsidies would help make better use of scarce public resources. For more than four decades New York City’s 421-a property tax exemption was a polarizing public program—extolled by some for its impact on spurring residential development but criticized by others for its perceived inefficiencies. The program encouraged development of new multifamily construction by providing a temporary reduction in taxable value with benefit periods lasting 10 years, 15 years, 20 years, or 25 years depending on where the building was located and whether the project included support for apartments affordable for low-income tenants.1 The 421-a program was allowed to lapse in January 2016, but policymakers and trade groups continued to discuss its revival or replacement and Governor Cuomo proposed a new version as part of his recent state budget plan. How much more do people pay for a 421-a condo compared with an otherwise similar condo that does not receive the 421-a tax abatement? How does that increase in sales price compare with the tax savings received by condo purchasers? Answering these questions provide important context for ongoing 421-a policy debates. For instance, the program is often argued to be too inefficient.2 If we know how much more buyers pay for 421-a condos than what would have been paid for a similar non-421-a condo, and we know what was received in tax savings, we can estimate how inefficient the program is for condo development, if at all. This and other policy implications are discussed more fully later in the analysis. With respect to the first question, IBO finds that on average buyers in Manhattan pay 0.43 percent of the sales price for each additional year of 421-a benefit; in all other boroughs the size of the effect is 0.40 percent. At average sales prices and average years of exemption remaining, these estimates imply the average 421-a Manhattan condo purchaser pays $35,500 more than the buyer of an otherwise similar, non-421-a Manhattan condo while the average 421-a condo owner in all other boroughs pays $31,200 more. With respect to the second question, IBO estimates Manhattan condo buyers spend on average $0.53 to $0.61 of every $1 in tax savings appearing on a tax bill in order to receive the remaining $0.47 to $0.39 over the rest of the tax benefit period. Outside Manhattan, our estimate is $0.42 to $0.50 of each benefit dollar is paid upfront at the point of sale. It is important to note that property tax exemptions may have broader market effects. For example, a 421-a benefit that increases condo prices would encourage developers to pay more for land, possibly leading to a general increase in land prices. For this reason, owners of potential sites for 421-a condo developments could be major beneficiaries of the 421-a program.3 The program may also change the incentive to build one form of housing over another—rentals rather than condos, for instance. The focus of this study is strictly on the retail market for condos. In contrast, questions about land use and developer bidding behavior are related to the market for land and can only be answered using a different research strategy and data than IBO employs for this analysis. Property tax exemptions lower the cost of ownership, increasing prospective buyers’ purchasing power, and as a consequence their willingness to pay for housing. All other things equal, then, we should expect an increase in demand (technically the quantity demanded) for condos with a 421-a exemption, and by extension a price premium for such housing. When the value of an asset varies by its tax liability the tax is said to be capitalized. If the present value of the future tax savings equals the 421-a price premium, the tax benefit is fully capitalized. If there is no change in price in the presence of 421-a, the benefit is not capitalized. Between these extremes, where the tax benefit increases the home’s value but by less than the value of the benefit, the benefit is said to be partially capitalized. To estimate the extent to which 421-a is capitalized into condo prices, we employed a repeat-sales regression, a statistical technique that reveals how two variables relate when holding other factors constant. In this case, we sought to explain the relationship between changes in condo sales prices and changes in the number of years remaining in the 421-a benefit period for each apartment as of the year of sale while simultaneously accounting for other differences between condos that might influence changes in sales price. Further information on the statistical strategy is offered in the technical appendix. Some transactions involved multiple properties. Because the sales price is recorded in the aggregate, there is no way to know the sales price of each tax lot in the bundle. Thus, sales involving multiple tax lots, which may include condos, were eliminated. This step dropped 8,365 sales. The unit must be greater than or equal to 200 square feet and less than or equal to 10,500 square feet, the latter being the largest known condo on the market recently. Sales records outside these bounds were assumed to reflect documentation error. This step dropped 800 sales. Sales where the inflation-adjusted price was less than $80,000 were dropped. We assumed that properties changing hands below this threshold were not arm’s-length transactions or nonresidential transfers such as parking spaces. This step dropped 26,744 sales. From the sample pool, we then identified condos that were sold multiple times during the 11-year observation period. After pairing each sale with the prior sale, the sample was whittled down to 22,048 sales pairs. The final step to purge the sample of bad data was to remove all sales pairs showing unrealistic annual changes in prices that presumably reflect transactions that are not arm’s length such as short sales. IBO dropped from the sample any sales pair showing an average annual inflation-adjusted increase of 30 percent or more or an average annual inflation-adjusted decrease of 20 percent or more. These thresholds are the largest percentage increases and decreases in inflation-adjusted median condo prices since 2005. This step dropped 3,551 sales pairs. Sales over $5 million were also dropped so as not to allow the few hyper-luxury condos receiving the abatement from skewing the estimated average price response.5 This step resulted in 780 fewer sales pairs. Thus, the final sample contains 17,717 sales pairs. Given substantial differences in demand for condo housing in Manhattan versus the rest of the city (Manhattan condo sales comprise almost three-quarters of the sample) as well as programmatic differences in benefit eligibility across the boroughs (10-year and 20-year benefits were only available in Manhattan, for instance), IBO generated two point estimates of the 421-a price effect, one for Manhattan and one for the other four boroughs jointly.7 The results are posted in the table in the technical appendix. IBO estimates that Manhattan condo owners on average paid 0.43 percent of the sales price upfront for each additional year of 100 percent 421-a benefits remaining. In the other boroughs, the average upfront payment is 0.40 percent of the sales price for each remaining year of 421-a benefits. At mean values, the average 421-a price response is $35,500 in Manhattan, compared with $31,200 in all other boroughs.8 The average sales price is higher in Manhattan than elsewhere in the city ($1.45 million versus $640,700), but the average benefit period shorter (5.7 years versus 12.2 years). In order to determine the degree of capitalization, we estimated the average 421-a lifetime tax savings in the two geographic areas: inside and outside Manhattan.9 Converting the value of future tax savings to the present requires an assumption about buyers’ discount rates. Discount rates tell us how much people value consumption today relative to consumption in the future. For example, if I am indifferent to receiving $1,000 in tax savings today and $1,100 in tax savings next year, I discount the future at 10 percent. Said differently, I would need to receive $100 more in tax savings next year in order to forego the consumption I would enjoy if I received the $1,000 in savings today. Due to the uncertainty of how buyers value future tax savings, we estimated the present value tax savings at various discount rates. It is common to assume a discount rate between 4.0 percent and 7.0 percent in residential real estate research.10 In certain extreme instances we may also find that property owners discount the future less than 3.0 percent.11 Therefore, we estimate future tax savings using three rates—2.5 percent, 4.0 percent, and 7.0 percent—to gauge how sensitive our estimates and conclusions are to the discount rate assumed. At all three rates we find that the 421-a benefit is partially capitalized into sales prices on average, but the estimated degree of capitalization displays some sensitivity to the assumed discount rate. At a discount rate of 2.5 percent, condo buyers in Manhattan on average pay 53 percent of their 421-a benefit to the seller upfront. At the 7.0 percent rate, the upfront payment for Manhattan averages 61 percent. Based on these two extremes, it is reasonable to conclude that in Manhattan the average condo buyer pays anywhere from 53 percent to 61 percent of their future 421-a tax benefits up front through the greater selling price. Outside Manhattan, the estimates show a similar degree of sensitivity to the discount rate: there is an 8 percentage point spread between the extremes in both cases. We conclude that condo owners outside Manhattan on average pay 42 percent to 50 percent of their 421-a savings at the time of sale in order to receive the balance over the remaining benefit period. The pattern of capitalization between the two areas is consistent with what we expect given differences in buyer preferences between Manhattan and the rest of the city. Buyers with stronger geographic preferences are generally willing to pay a premium to live in their preferred area. Sellers in high-demand areas have greater market power than sellers in low-demand areas, providing the former greater opportunity to extract an additional dollar from buyers whose strong location preferences make them relatively insensitive to small changes in price. In the case of a development tax incentive such as 421-a, the buyer pays the increase in the sales price from the future stream of tax savings. If the marginal sales price is mortgage-financed, the buyer effectively borrows against the real value of the property. The sensitivity analysis further shows that regardless of the discount rate, more of the 421-a benefits are capitalized into sales prices in Manhattan than elsewhere. We can provide some evidence that the interaction of these forces of supply and demand play a role in the estimated differences in capitalization by observing residential absorption rates. An absorption rate indicates how long it would take to exhaust the inventory of properties on the market. The measure is calculated as inventory available divided by the average number of sales occurring over some period of time. Absorption rates are useful for comparing market characteristics. In markets where many sales occur and there is little inventory, markets clear quickly, benefiting sellers. In markets where few sales occur and there is much inventory, markets clear slower and are more buyer-friendly. For example, if we observe that for the same period of time market A has an absorption rate of 5 months and market B has an absorption rate of 10 months, it would take twice as long to clear market B’s inventory than market A’s inventory. We can conclude that market A is more seller-friendly than market B.
IBO collected quarterly absorption rates for condos in Manhattan and all nonrental residential property in Brooklyn and Queens from 2010 through 2015 in order to compare Manhattan condos with their substitutes in the other boroughs.12 Absorption rates for the Bronx and Staten Island are not available, nor are rates for quarters before 2010. With the exception of mid-2014 through 2015, the market for Manhattan condos tended to clear more rapidly than other markets for residential properties. Because the data only cover half of the study’s observation period, however, we cannot be certain that observed differences in capitalization between Manhattan and the rest of the city are due to differences in availability of housing and housing demand.13 The evidence does point towards that explanation, though. The policy implications of this study’s findings are threefold. 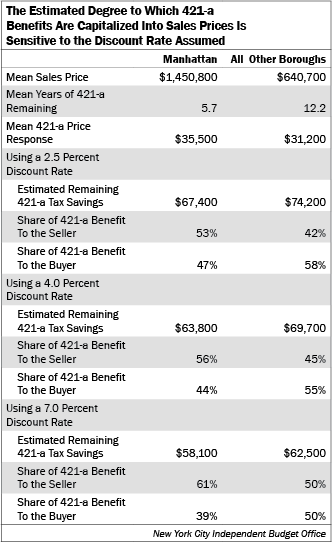 First, because the tax is partially capitalized, the 421-a benefit buyers actually enjoy is less than the total tax savings reflected on their tax bills. Condo owners may appear to be the sole benefactor of the tax break since the exemption appears on their tax bill in the form of reduced taxable assessed value, but because the owner had to pay a higher price for the 421-a apartment than what they would have paid for a similar non-421-a apartment, the benefit appearing on tax bills overstates the benefit actually enjoyed. That is to say that our intuition confuses statutory incidence (i.e. who receives the tax reduction) with economic incidence (i.e. who benefits form the tax reduction). When economic incidence diverges further from statutory incidence, development tax incentives increasingly stray from their stated purposes. The faster the divergence occurs, the more quickly policymakers must respond to modify program eligibility criteria and benefit levels to ensure the program is achieving its goal at the lowest cost. Second, on a related note, our findings provide an estimate of program inefficiency. The 421-a program is intended to spur new construction. It is not intended to serve as tax relief like many of the city’s other programs are designed to do, such as the senior citizen and veteran exemptions. Our results indicate that condo owners receive more in tax savings than they pay in higher sales prices, and therefore condo owners receive tax relief through a program intended to incentivize development. Indeed, any share of 421-a benefits (or any land development tax incentive) that accrues to homeowners and not to land owners (who may or may not be the developer) represents public resources not allocated for their intended purpose. Based on this study, over the last 11 years a third to a half of the 421-a tax expenditure committed to condos in Manhattan and about two-thirds awarded in the rest of the city is waste, or a total of $2.5 billion to $2.8 billion depending on the discount rate assumed. It represents wasted dollars because buyers are receiving more in benefits than they pay for and the excess does not incentivize development, which is the program’s policy goal.14 Thus, the program’s inefficiency stems from its benefits being too generous. Eliminating condo eligibility from the program would obviously remove the waste, but policymakers may desire some condo development that would otherwise not occur without government intervention. A reduced and better-targeted set of benefits could in theory reduce the program’s inefficiency while still providing some incentive for condo development. Identifying the level at which benefits must be set so that a subsidy accrues entirely to the intended beneficiaries is challenging because developer behavior changes faster than policymakers’ adjustments of program benefits and eligibility criteria. Perfect economic efficiency is a moving target, and as such an entirely waste-free program is likely an impractical and cost-prohibitive policy goal. Nevertheless, as New York policymakers look to revive 421-a (or a similar variant), giving greater attention to the program’s benefit levels so as not to oversupply tax subsidies would help make better use of scarce public resources. Finally, because the 421-a benefit is partially capitalized, it contributes to higher land costs. Housing is becoming increasingly expensive for the average buyer. Knowing how much more exempted properties sell for than properties that are not exempted is a crucial component for weighing the 421-a program’s policy merit as a development incentive against the higher market prices for land the tax incentive likely creates. While this study is not an analysis of 421-a’s effect on land prices, the findings of partial capitalization in condo sales prices suggests that condo developers pay more for the land than they would if the tax exemption did not exist.15 The tax incentive is thus contributing to its own existence: advocates argue the program is necessary to make housing more affordable but the program itself likely contributes to higher land prices, therefore making housing more expensive. The tax incentive can be viewed as a problem or a solution, and depending on the policy question it can be both. Property tax subsidies are a solution when the policy goal is to encourage development of one form of housing over another (such as making rental housing a more attractive investment than condo development) even if the subsidy contributes to a general price increase for all real estate. For more details on the report’s methodology, read the appendix here. 1Under the now-suspended program, the exemptions were not at 100 percent of the increased assessed value for the entire benefit period; benefits gradually phased out. For 10-year benefits, the phase out began in the third year; for 15-year benefits, in the twelfth year; for 20-year benefits, in the 13th year; and for 25-year benefits, in the 22nd year. For 10-year and 20-year benefits, the exemption declined by 20 percentage points every two years. For the 15-year and 25-year benefits, the decline was 20 percentage points each year. 2Commentators making this argument are too abundant to make an exhaustive list. For more detailed discussion on the program’s perceived inefficiency see Cohen, S. B. (2009). “Teaching an Old Policy New Tricks: The 421-A Tax Program and the Flaws of Trickle-Down Housing.” Journal of Law and Policy, 16(2), 6; Waters, T., & Bach, V. (2015). “Why we need to end New York City’s most expensive housing program.” New York: Community Service Society of New York. 3Property tax exemptions may be financed by other taxpayers in the form of higher property tax rates. To the extent this is true, owners of land upon which no 421-a development occurs will see the value of their land decrease because of the higher property tax burden. 4The dataset only includes residential condos that do not include coop units. 5We assume that buyers of luxury properties are much less sensitive to the presence of a tax break than other buyers; that the amenity value of a tax break declines non-linearly as reservation price increases. Thus, we exclude luxury properties because the 421-a tax break would not be discernibly capitalized, if at all, into luxury sales prices at the high end of the market. We arrived at the $5 million threshold by testing different price thresholds from $2 million to $10 million in increments of $1 million. Parameter estimates became less precise and more likely due to chance as more properties over $5 million were included. Using this paper’s dataset, the price difference between 421-a and non-421-a condos over $5 million is not statistically different from zero. 6A few buildings in Lower Manhattan have both 421-a and 421-g exemptions with converted apartments receiving the latter and new apartments—constructed by extending a building vertically—receiving the former. 7While it would be interesting to analyze patterns in even smaller geographic areas such as core areas of Brooklyn, there were not enough repeat sales during the observation period to generate reliable estimates to do so. 8Average price responses are calculated as the product of the average number of 421-a years remaining at the time of sale and the market value of one more year of 421-a benefits for a condo at the average sales price. For Manhattan, the calculation is (5.7) (.0043)($1,450,000) = $35,500 while for the rest of the city it is (12.2)(.004)($640,700) = $31,200. 9We created cohorts for each exemption length for each fiscal year from 2005 through 2015 with a cohort year reflecting the year a condo building first appeared on the tax roll with the 421-a exemption. Exempt values for future years followed the 421-a program’s phaseout requirements with the underlying assessed values being grown annually by 3.8 percent, which is the average annual growth rate in the Case-Shiller Manhattan condo index from 2005 through 2015. We then adjusted all exempt assessed values to present terms. For each exemption length and cohort year, we then determined the lifetime tax savings by summing over the benefit period the product of each fiscal year’s exempt assessed value and the 13.06 percent tax rate, or the average Class 2 tax rate from 2013 through 2015. Finally, we calculated the annual average 421-a lifetime tax expenditure for each cohort in each geographic area. 10See, for example, Do, A. Q., & Sirmans, C. F. (1994). “Residential property tax capitalization: Discount rate evidence from California.” National Tax Journal, 47 (2), 341-348; Getry, W. M., Kemsley, D., & Mayer, C. J. (2003). “Dividend taxes and share prices: Evidence from real estate investment trusts.” The Journal of Finance, 58 (1), 261-282; and Sirmans, S., Sirmans, C., & Benjamin, J. (2009). “Determining apartment rent: The value of amenities, services and external factors.” Journal of Real Estate Research, 4 (2), 33-43. 11Recent research from international real estate suggests that extremely long-run cash flows are discounted less than the common 4.0 percent to 7.0 percent range typically assumed. Over 100 years, property owners were estimated to discount cash flows at 2.6 percent, for instance. Giglio, S., Maggiori, M., & Stroebel, J. (2015). “Very long-run discount rates.” The Quarterly Journal of Economics, 130 (1), 1-53. 12Quarterly absorption rates for each borough were collected from market reports for each borough authored by Jonathan Miller of Miller Samuel Inc. and published by Douglas Elliman. 13Absorption rates may also be more meaningful when price ranges are considered. Homes in the $300,000 to $500,000 price range may have a different absorption rate than homes in the $500,000 to $1 million range even if homes in both ranges have the same rate regardless of borough. The available absorption rate data does not allow for this level of analysis, however. 14Our estimate of waste does not factor in additional revenue to the city from the real property transfer tax (RPTT) or the mortgage recording tax (MRT) due to the higher sales prices for 421-a condos. These taxes are likely capitalized into home prices to some degree. IBO’s back of the envelope estimate indicates that under generous assumptions the additional RPTT and MRT revenue from the higher sales prices for 421-a condos during the observation period is about $48 million, too small of a revenue windfall to noticeably affect the estimated waste. 15For more discussion on the theory and empirical evidence of capitalization and land and home prices, see Yinger, J., Bloom, H. S., Boersch-Supan, A., & Ladd, H. F. (1988). Property taxes and house values: The theory and estimation of intrajurisdictional property tax capitalization. New York: Academic Press; Ihlanfedlt, K. R., & Shaughnessy, T. M. (2004). “An empirical investigation of the effects of impact fees on housing and land markets.” Regional Science and Urban Economics, 34 (6), 639-661.